TLIF (transforaminal lumbar interbody fusion) is a minimally-invasive spinal procedure used to stabilize vertebrae and discs. TLIF involves the insertion of screws and rods into the spine and the fusion of adjoining vertebrae on both the posterior and anterior portions of the spine. This type of procedure has many advantages, including an increased chance of success with the fusion, as well as an improved recovery period. TLIF can be used to treat a range of back conditions including recurrent herniation and degenerative disc disease, and may also be used to correct prior surgery that was unsuccessful. At ProMedSPINE, our back surgeons have the expertise necessary to perform this and other spinal treatments. The purpose of TLIF is to fuse the front and back portions of the spine through a single approach. The TLIF procedure is performed through the back at a slight angle to the spine. The back muscles are essentially moved to the side rather than cut through as with some other back procedures. The nerves are also more easily avoided with this approach. Due to the minimized amount of muscle, tissue, and nerve disruption, the surgeon is able to focus on the spine and the patient experiences a quicker and less painful recovery. In most cases, the surgery is done through two small (one inch) incisions. This spinal fusion surgery first requires the use of an imaging device to locate the disc space to be operated on. A tissue retractor is put in place to widen the surgical area and provide visibility. Once the disc is located and everything is in place, the disc is removed and the space is prepared for fusion. A fusion cage is inserted in the area of the removed disc and a bone graft is implanted. The main advantage to the TLIF procedure over other graft procedures is that the graft is put on both the front and back of the spine. This increased graft area not only raises the chances of a proper healing graft, it also promotes stability and enhanced load-bearing of the spinal section. A set of rods and screws are inserted into the spine along with the fusion cage and graft. This surgical hardware is inserted to help facilitate the bone fusion process and stabilize the spine, even though the screws can be removed later if needed. An inter-body fusion spacer is put into the disc space from the side and pedicle screws and rods are put into the back of the vertebra. As time passes, the graft heals and creates one solid bone in between the vertebrae. To learn more about interbody fusion, please visit AAOS. Since every case is different, it is important to discuss all possible treatment options with your surgeon. Our spine surgery experts have experience in many types of spinal conditions and procedures and can find the most optimal treatment for your individual case. With the TLIF procedure, the surgeon can insert the spacer and bone graft from a unilateral approach through the side, minimizing the disruption to surrounding tissue and nerves. This alone carries many benefits in terms of recovery, risk, and post-op pain. The spacer that is inserted during a TLIF procedure helps restore the normal characteristics of the disc and section of the spine. The TLIF procedure can be an effective treatment option for lumbar spinal conditions requiring fusion. The specifics of the procedure along with its unique approach present many distinct advantages over other types of fusion surgery. Although TLIF may be the best available option in some cases, it may not always be possible in some cases. 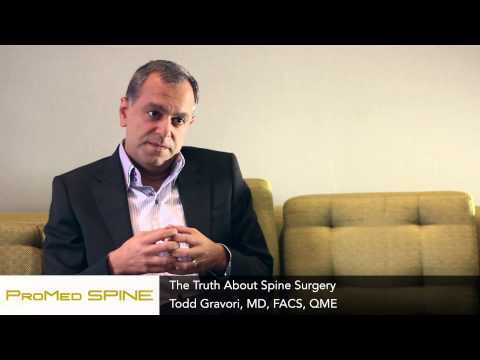 It’s important to discuss all treatment options with an expert such as those at ProMedSPINE. Our spine surgeons have the expertise necessary to perform TLIF surgery and give patients the relief they deserve. We offer a compressive consultation and free MRI readings in order to determine whether or not TLIF surgery is right for you. We will always find the best course of treatment for your individual case. If you are a patient considering TLIF spine surgery at one of our three locations in Beverly Hills, Encino, or Valencia, please contact our spine surgeons today! Next, please read about ALIF surgery.